If it’s August, it’s time once again for our summer potluck and raffle. 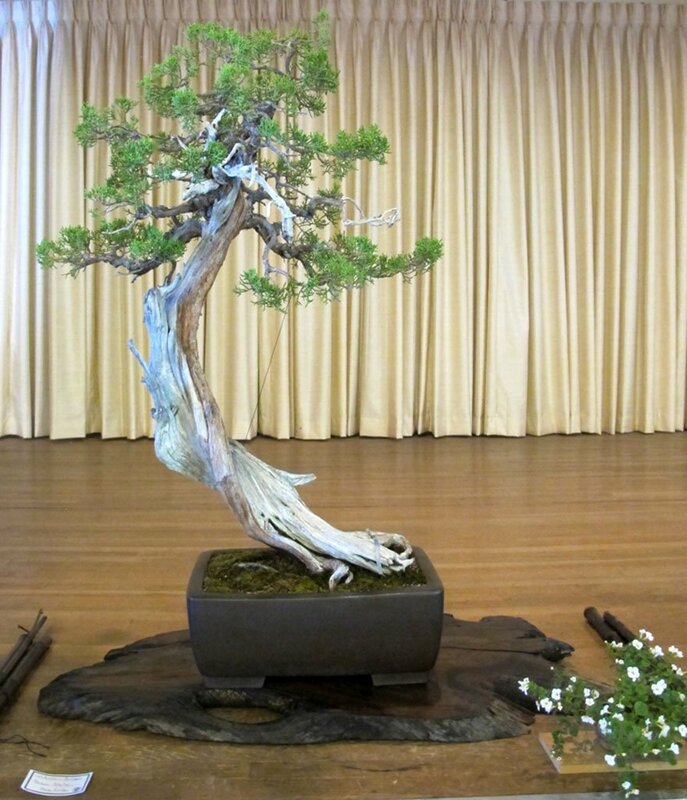 Plan to bring a dish to share, any bonsai-related items you can donate to the raffle, and enjoy the day. Tom Treloggen, one of our new members, has volunteered (really!) to host the party at his house this year. Thank you, Tom, we are looking forward to seeing you on Sunday, August 27. The potluck isn’t the club’s only event this month. 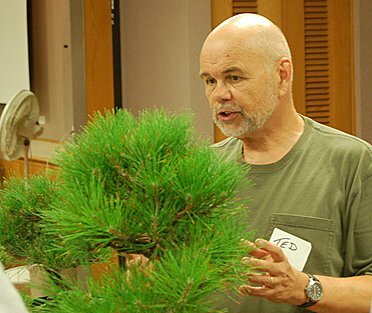 Tom Post has more nursery visits scheduled: to Roy Nagatoshi’s Fuji Nursery on the 5th, to Travis Goldstein’s California Bonsai Studio on the 19th, and to George Muranaka’s Nursery on September 2. July was a busy month: In addition to our regular Tuesday evening meeting – a critique of members’ trees with more trees than we had time to discuss – Tom Post led a Saturday trip to Bob Presslers’ nursery in Northridge and we had a small but very well received display at the Santa Barbara Obon Festival where Carol Hicks, Steve Iwaki, Ernie Witham, Tom Post, Wally Kunimoto, and I participated. We need a few more people to sign up for the fall semester 3rd Saturday afternoon workshops. Please consider it: It’s a bargain! The instructors are the best anywhere and the cost is much lower than you’d have to pay for them at a convention or anywhere else. Once again, members brought trees to our annual member’s critique and were rewarded with some great advice. Steve Gibson brought some of his “larger” shohin. It was suggested he prune his lantana earlier rather than later so the flowers don’t become too leggy. Wally brought in a cork oak that had lost a major branch and he now needed to find a new front. There were a lot of opinions, so I suggested putting it into a round pot with a lot of legs, so it could be turned to please whoever was looking at it. Ann also suggested the roots were too high and it should be repotted. Wally also had a pomegranate that had never bloomed. Joe suggested he be patient. Joe had one that didn’t bloom for 30 years. Wally is going to start eating healthier so he can live long enough to see it bloom. Joe brought in a maple. It was suggested his bonsai mix was too dry for that tree. Lou brought in a ficus that he dug up from his yard. 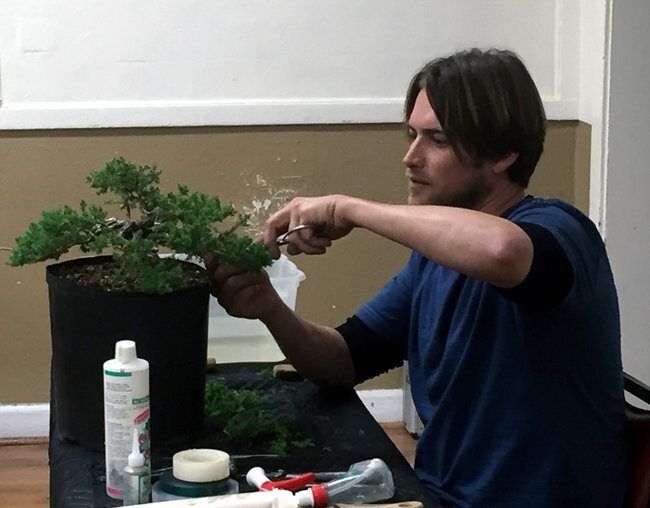 He sawed off the top and we all suggested he “carve, carve, carve.” New member Jeff brought in his juniper from the recent beginner’s workshop. It was suggested he could shorten the upper branches by wiring more movement into them. Steve Iwaki brought in a black pine that had a lot of unhealthy needles. Ann suggested putting white vinegar in his water cutting bad needles in half so as not to loose the buds and spraying foliage with fish emulsion. I brought in a struggling San Jose juniper. It was suggested I was over pruning and I should let the foliage go as long as I had let the weeds go. Joe’s maple. 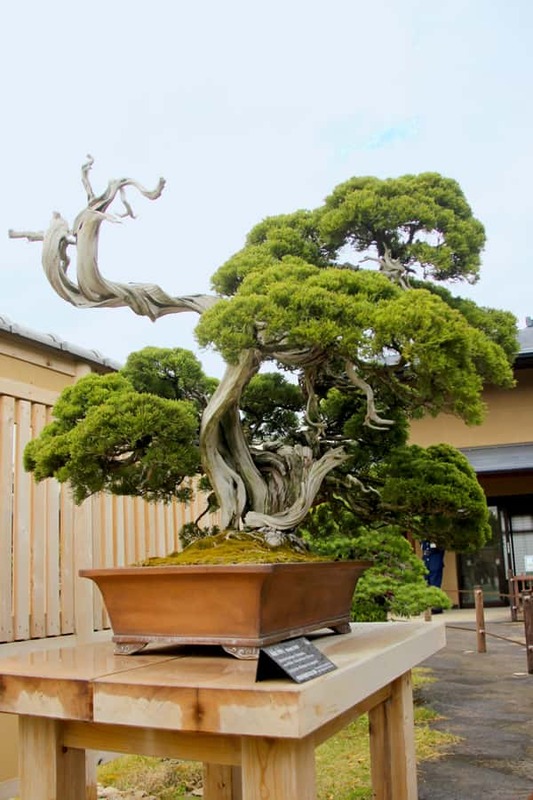 Use a better bonsai mix. Here are a few photos from our exhibit. 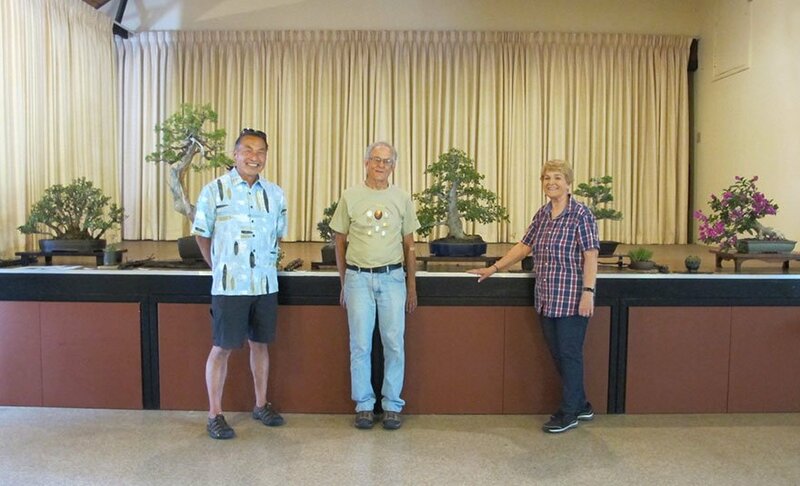 Steve Iwaki, Joe Olson and Carol Hicks in front of some of the displayed trees. Kevin McGarry, Director of Programs, Santa Barbara Trust for Historic Preservation. Please think about bringing one of your trees for our display. We always get a nice response from visitors. Contact Joe Olson, joeyuccaseed@verizon.net, for more information. Tom Post has set up visits at some bonsai nurseries close to us. 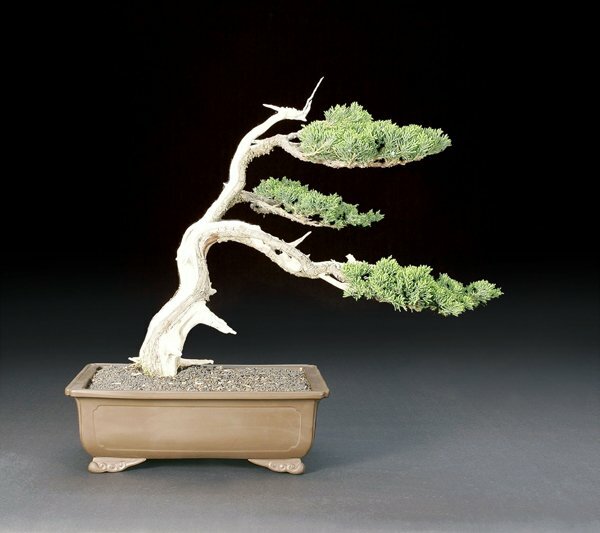 This is a great time to buy great bonsai stock to work on or already finished trees. There are three visits remaining. Meet at the upper Sears parking lot in LaCumbre Plaza at 8:00 am and carpool from there. We usually stop for lunch, so bring lunch money and tree money. Most nurseries also have soil, tools and pots for sale. About 8 years ago, I was passing my neighbor’s yard on my morning walk and had been noticing that there were short trees with great movement all over his front yard. I couldn’t tell what kind of trees they were because there were almost no leaves on them. My neighbor was out front, so I asked what they were and he told me that they were bougainvilleas, but they had never done well in his yard. They had been there for at least 30 years. Fortunately, I told him that if he ever wanted to get rid of them to let me know and I would dig them up for him. Sure enough, several months later, he saw me and said come and get them. BONANZA ! It turned out that they had been in pretty deep shade all of that time. Placing them in full sun did the trick. I cut all flowering off for two years so that I could work primarily on the branch structure. They are becoming more compact each year.